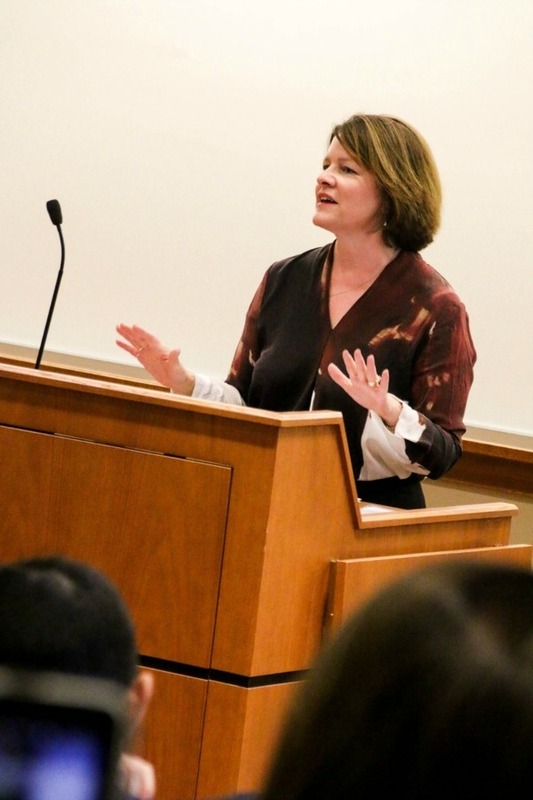 Maureen Ohlhausen, commissioner of the Federal Trade Commission, recently spoke to Notre Dame Law School students about how the FTC protects consumers and maintains competition through the enforcement of antitrust and patent laws, and how these two legal fields interrelate. Ohlhausen explained to students that antitrust law protects the competitive process, which benefits consumers through lower prices, higher quality products, and an increased rate of innovation. At the same time, she said, inventors are then incentivized, through patent law protection, to invest in new technology. In addition, they receive benefits of market power and good prices, she said. “Both serve consumer welfare,” Ohlhausen told the students. The FTC commissioners spend a considerable amount of time enforcing antitrust and patent law for the pharmaceutical industry, where competition has some unique features due to the regulatory requirements facing branded and generic drugs, she said. Ohlhausen noted that the Hatch-Waxman Act makes it easier for generic drugs to enter the market. When a branded-drug patent expires or becomes invalid, generic drug companies only have to file a simplified application. The law offers protection to drug innovators, while also providing incentives for generic companies to compete. The problem is that the law also creates an incentive for the branded drug company to pay the generic drug manufacturer to delay or forego entering the market. This allows branded drugs to avoid competition and any challenge to their patent, she said. The FTC challenged such agreements on a number of occasions, and brought a case all the way to the Supreme Court case against Actavis, Inc. The Supreme Court ruled that a branded drug manufacturer’s reverse payment to a generic competitor to settle patent litigation can violate U.S. antitrust laws, she said. “The reverse patent settlement agreement in Activis offered the Court an opportunity to address an important and challenging area of intersection between patent law and antitrust law,” Ohlhausen said. 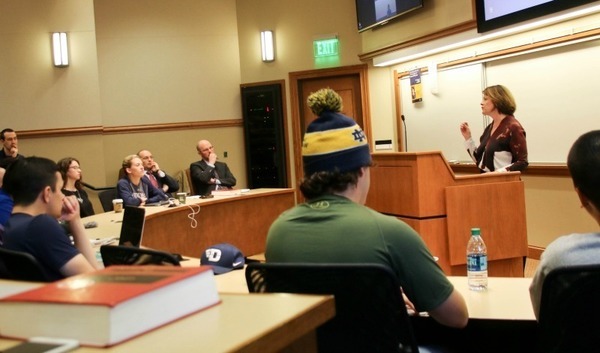 Ohlhausen visited NDLS as a distinguished speaker of the Research Program on Law and Market Behavior. ND LAMB is dedicated to promoting foundational research that seeks to influence the way scholars and policymakers think about a range of timely legal and policy issues at the intersection of law and market behavior. Originally published by Denise Wager at lamb.nd.edu on November 30, 2016.